The first steps in designing a yarn from scratch is deciding what fiber content it will be and what weight and type of spin/twist/plies. Once we put our request in with the mill, they create a sample based on those perimeters. When it's ready, they send us a few skeins to try, often in natural color. That was the scenario for our Cria Lace a lace weight blend of fine alpaca and tencel. So, not wanting to wait until all the colors were developed, dyed and delivered, I promptly began designing the very first garment with the natural color sample. 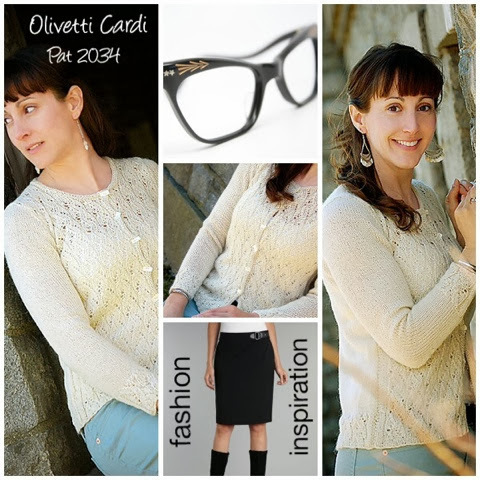 And voila, the Olivetti Cardi! Here are a few photos showcasing this design in today's Fashion Inspiration mood board. Although Cria Lace is lightweight, I held 2 strands together to give me a gauge of around 5.5 stitches per inch. It turns this one yarn into two different ones, and at over 500 yards per hanks, a smart knitting choice!